THIS FORM IS FOR NEW CUSTOMERS ONLY. If you have been enrolled in our program before, please click the "Already a customer" above. IMPORTANT: To make a payment online, please click on the "Parent Log-In" tab. Please click on the section "Billing & Payments" at the top of the screen or the "Pay Now" button to pay with a credit/debit card. There is a Spring Show fee of $18.00 per child that will be added to your balance once you have registered. This is for the Spring Show uniform. If you decided that your child(ren) will not participate in the Spring Show, please contact the office for a refund. Included in your tuition costs is a $10.00 Enrollment Fee. The Enrollment Fee covers the expense for the convenience of our online payments, registration and software system. I hereby for myself, my child(ren) adopted or otherwise, my heirs and executors, waive and release any and all rights and claims for damages that I may have at any time against Fergus Falls Gymnastics Academy, their agents or representatives; for any injury or damages that may be suffered by me, my child adopted or otherwise, in connection with my association or entry in gymnastics or other activities sponsored by Fergus Falls Gymnastics Academy. I understand that participation in gymnastics activities involves motion, rotation and height in a unique environment and as such carries with it the risk of serious injury. I further agree and consent to emergency treatment of my child by a physician or hospital in the event that I cannot be reached. I/We give the coaches of the Fergus Falls Gymnastics Academy permission to transport my/our child to the emergency room of the hospital, or to use an ambulance if necessary, and authorize treatment if I/we, as parent(s)/guardian(s), are not available to be reached by the coaches in case of serious accident or injury. 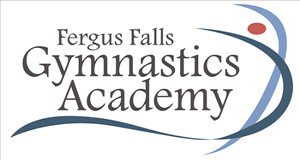 Classes at the Fergus Falls Gymnastics Academy will be cancelled if the weather conditions are dangerous. As a general rule, if school or activities are cancelled for Fergus Falls Public Schools, gymnastics will also be cancelled. To be informed of school closing, subscribe to the ISD 544 weather related alerts or check local radio and television stations. Weather related cancellations will not be made up unless coaches of the Competitive/JV/Varsity teams mutually decide to issue a make-up day. Teams and meets will not be affected by previous-day school cancellations. The Team coach, will determine whether or not a meet is cancelled. Team practices may be cancelled at the discretion of the coaches. In this event, the coaches may issue a make-up day, in accordance with the MN State High School Rules and Regulations. Please stay up to date with class notes and your email for information regarding unplanned cancellations. Tuition for a recreational class should be paid in full by the first day of each session. If not paid, an email will be sent out for a reminder and then a $10 late fee will be assessed if not paid by the due date. A third child discount of 50% will be applied to the smallest tuition fee. For any child after the third, a discount of 100% will be applied to the smallest tuition fee(s). Refunds will not be given for individuals who miss class(es). This includes regularly scheduled classes and make-up classes. Payments can be made: 1) online with credit/debit card or e-checks 2) mail cash/check to PO Box 1004 3) bring payment on the first day of class. Registration will be open online for a fixed period of time prior to the upcoming session. Online registration will close one (1) week before the first day of the session. Participation in the program is not allowed if registration has not been completed. A family with an outstanding balance from a previous session will be unable to register until the balance is paid in full, unless otherwise arranged with the Office Staff. If we have a student that has not shown to class and has not communicated with the FFGA Staff at all, their spot will be given to the next person on the wait list. Our Competition Teams have mandatory fundraising. Our Recreational Classes do not have mandatory fundraising at this time. I hereby grant permission to FFGA to use photos of my child. Such use includes the display, publication, distribution, and transmission of photographs, images, and/or video taken of my child for use in materials that include, but may not be limited to, printed materials such as brochures and newsletters, videos, and digital images such as those on the FFGA's Website and Facebook page. If you DO NOT want to grant permission for this, please check the box to let us know you read it and email the FFGA office (ffgymnastics@gmail.com) to let them know your child's name and that you do not want any photos displayed of them. Thank you!